The New England Patriots and the Kansas City Chiefs will battle it out late Sunday afternoon in Arrowhead Stadium for a trip to Super Bowl LIII out of the AFC. Game time on CBS is set for 6:40 p.m. Playing in the AFC title game has become old news for New England in what will be the team’s eighth-straight appearance in the conference championship. The Patriots have gone 4-3 straight-up in the other seven games. They are 12-5 SU with a 10-7 record against the spread this season after beating the Los Angeles Chargers 41-28 in Sunday’s Divisional Round as four-point home favorites. New England was 3-5 ATS in eight previous road games this year. 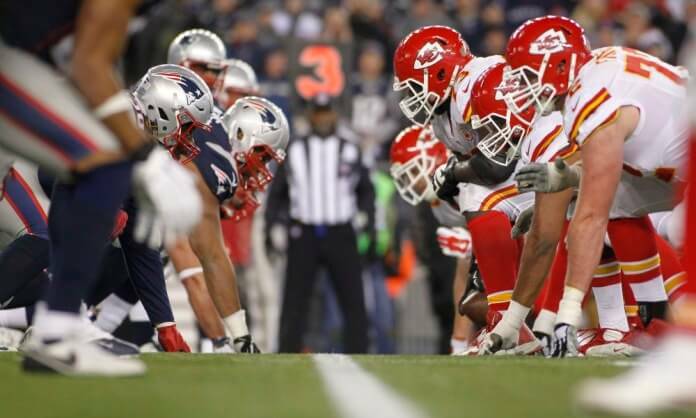 These two teams met on Oct. 14 in the regular season with New England outlasting the Chiefs 43-40 as a 3.5-point home favorite on BetAnySports’ closing line. The total easily went OVER an inflated 59.5-point betting line. In Sunday’s win against the Chargers, Tom Brady threw for 343 yards and one score while the Patriots racked up another 155 yards on the ground behind Sony Michel’s 129 yards rushing and three touchdown runs on 24 carries. Kansas City has had its issues in the early rounds of the playoffs under head coach Andy Reid, but it broke through that barrier on Saturday with a commanding 31-13 thrashing of Indianapolis as a 4.5-point favorite at home. The 13-4 Chiefs are 5-4 ATS at home this season, but they have failed to cover in six of their last eight games overall. The total went OVER in five previous games down the stretch before staying UNDER in their last two outings. The big story in Kansas City this season has been the play of second-year quarterback Patrick Mahomes. He has played to a level worthy of league MVP honors and Saturday against the Colts he completed 27-of-41 passing attempts for 278 yards. The Chiefs also did a great job running the ball with 180 rushing yards and four touchdowns on 33 attempts. The first game this season between these two offensive powers ended up as a shootout. I am going with the same scenario this Sunday in a game that goes OVER the current 57-point total line.